Back in March, the folks at Barrett Family Dental wrote a post about how “sugar drinks can harm more than just your teeth.” This week, Dr. Barrett thought it would be interesting to follow up with a new study that highlights another danger of sugary drinks: acidity. 1… 2… 3… times the trouble! Researchers from the University of Adelaide report that the acid in sugar drinks (soda pop, “energy” drinks, even fruit juice) is part of a “triple threat” that harms tooth enamel, causing irreversible damage to young people’s teeth. Coupled with acid reflux, which is on the rise in younger people, and night-time bruxia or tooth-grinding (also a common pastime for sleeping teenagers), the acid in sugar drinks is the crowning touch to the tooth traumatizing trifecta. Researchers at the University refer to the effect of this triple threat as “tooth erosion,” and note that the long term impacts can be extensive– leading to costly and even complex rehabilitation. Previously, imbibers of sugary drinks were encouraged by health professionals to brush their teeth afterward and by doing so– avoid the drinks’ damaging effects. However, according to this new study researchers found that the acid in sugary drinks began damaging teeth within 30 seconds of consumption. This means that no matter how much you brush after, unless you downed your drink in 10 seconds flat, chances are the event had a negative impact on your teeth. Researchers suggest eating fruit rather than drinking its juice, and skipping soft drinks and sports beverages altogether. The study concludes that oral pH is part of oral health; the balance of acids and bases within your mouth are part of your teeth’s protection. By shifting this balance toward the acidic, as when consuming sugary beverages, damage has been proven to occur! Yes, this is grim news for soda lovers. But part of our dental philosophy at Barrett Family Dental is to engage with our patients by providing them with all the latest dental health information so they are guaranteed to make sound, informed decisions about their health. Got more questions about oral pH, acid in the drink, or anything else this study mentions? 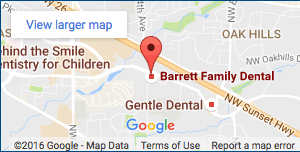 Please ask Beaverton emergency dentist Dr. Barrett at your next appointment! And for the curious, you can find an article detailing this new study here.